I am having a devil of a time getting rid of micro bubbles in a 70 gal. Just has live rock and substrate in it at the moment. There's a 10 gal sump that is fed by two independant 1.5" overflow pipes. The flex pipes are below the water level in the sump to reduce the noise level. I've siliconed and glued every union in the overflow elbows to seal any source of air. I'm fairly certain I've covered all the bases but snce the bubbles persist I'm obviously missing something. I'm even speculating that the bubbles will disappear as the tank matures. Any suggestions from you brilliant marine aquarists?? you need to bring the drains up above the water surface in the sump to allow the air that gets sucked down to escape. how much flow do you have through the 10G sump? any bubble traps in the sump? where are the bubbles injected from, the sump going in the tank ? you got a pic of the output bubbles. how tiny are they ? extremely tiny bubble I find usually come from skimmers.. if they are larger.. somewhere in the piping is causing this.. or you could have o2 bubbles being created in your sump..
is your sump emtpy or does it contain sand/gravel of some kind ? Raising the outputs would be the last resort. Not sure the noise level will be acceptable. Using a Mag 7 as a return pump. No sock, but it's worth a try. By bubble traps, do you mean baffles? If so, no baffles. The bubbles are coming from the sump return. The bubbles are extremely small, too small to be seen in a photograph. There's no substrate or coral in the sump. Thanks liv, appreciate your help. no baffles.. and your skimmer is near buy.. smells like skimmer bubbles bud. for fun, stop for skimmer for a few hours.. make sure you shake the mag pump so it gets rid of bubbles already formed in it.. watch the results. if so, you will have to either think to intergrate baffles or add a sock on the skimmers output. could you install baffles in the sump? or maybe a bubble tower?? you are using the mag7 internally?? this should rule out any plumbing problem. were is the skimmer located?? does it return to the sump as well?? I had to make the sump since it's contained in a narrow opening under the tank. Likely holds 7 gals. A baffle or two would solve the problem but there's no room unfortunately. I've never heard of a bubble tower....is there a link to an example (photos)? The Mag7 is submerged as is the skimmer. I confirmed that the bubbles continue even when the skimmer is removed. I made the sump out of black acrylic because I had it available. Makes it difficult to see the bubbles though. 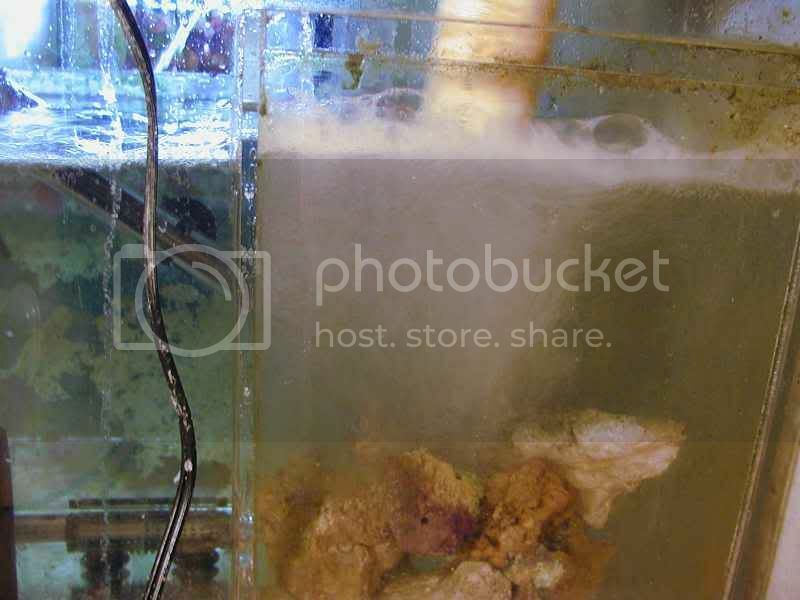 IMO, its a combination of the skimmer and the amount of water travelling through the small sump. bubbles are being created by the falling water and skimmer, then are carried right through the sump before they can dissipate. some solutions would be a larger sump, adding a bubble tower / baffles, slowing the water down, using a filter sock to try and collect the bubble ( has to be cleaned often ), adding some LR to catch bubbles. here's a pic of my bubble tower at work and a digram of the sump layout. Not anything else I can add except that a4twenty is on the money. Could you also provide some sort of diagram or good description of how your sump layout is done... Your bubble problem is not caused by the overflows. No matter what, your overflow pipes are made big enough to allow air and water to mix while it's coming down to your sump, so you can't change that. You have to figure out a way to get these bubbles STOPPED before they get back to your return pump. One other option, since your sump is so small, is drilling a hole and changing to an external return pump, and then placing babbles where the internal pump was located? AC REMORA - Micro Bubbles.